We’re more than halfway through October and pumpkin consumption is in full swing. Pumpkin lattes, bread, cookies and cakes, I’ve already eaten my fill and, if I’m being honest, I’m not slowing down until post-Thanksgiving. 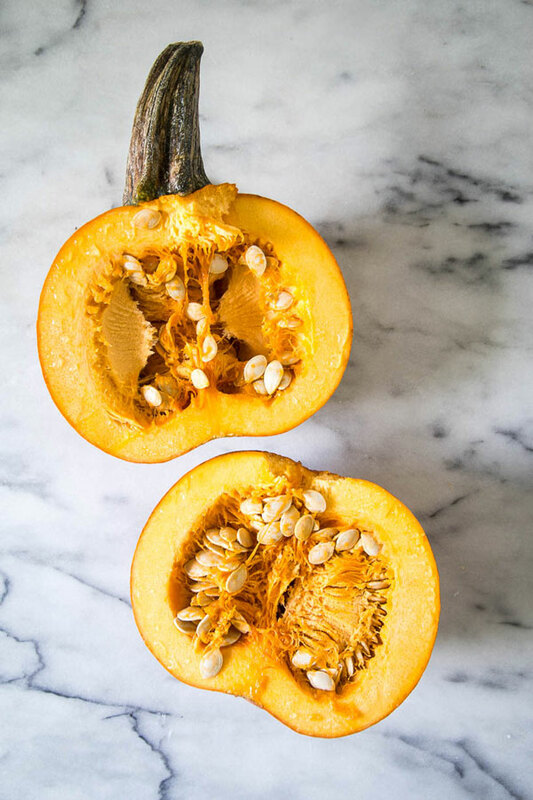 And while I love pumpkin spice as much as the next person, I often feel that the latte craze (#PSL) has resulted in a lack of creativity when it comes to cooking with fall’s most popular squash. Pumpkin spice, you’re great, but it’s time to step aside. 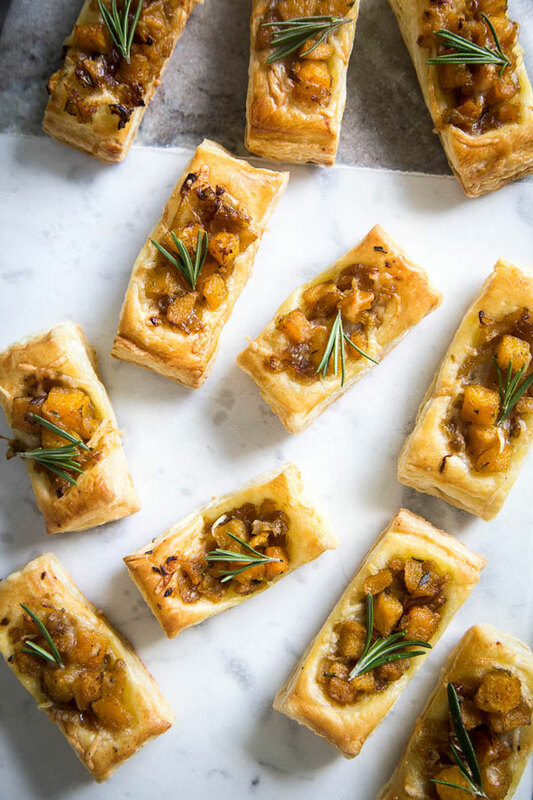 In an effort to explore pumpkin’s more savory side and develop a more wine-friendly flavor profile, I’m sharing a recipe for these Pumpkin & Rosemary Puff Pastry Bites. 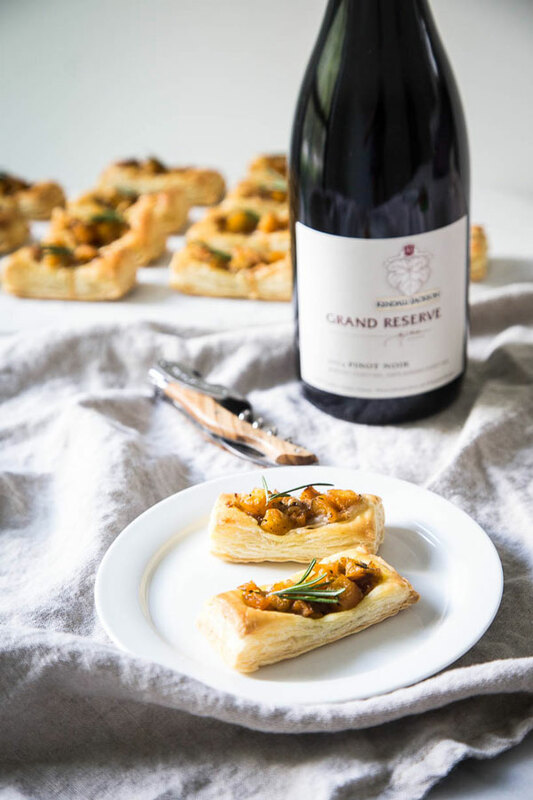 They’re incredibly easy to pull together -- we’re keeping things semi-homemade by using store-bought puff pastry -- and make for the perfect bite-sized appetizer for your fall entertaining needs. Since the goal is to highlight autumn’s best, I’ve kept the ingredient list for this recipe fairly conservative. We’re focusing on fresh, high-quality ingredients so you can spend as little time in the kitchen as possible (fall entertaining should be fun) and spotlight the best of the season. To start, sweet onion is slowly cooked until deeply caramelized to perfection. Pumpkin is then sauteed with garlic, fragrant rosemary and just a touch of cinnamon to add depth and richness. When assembled, we add sharp gruyere to the mix, providing that cheesy bite we all love while also acting as a melty, edible glue that holds our pumpkin pieces on the pastry as it puffs in the oven. And let’s not forget about the puff. I’ve never made puff pastry at home because I’m positive I couldn’t achieve the crisp and airy texture that the machine-made store bought variety offers. The flaky, toasty brown layers provide a lovely contrast to the soft, fleshy squash, resulting in what I must say is pretty darn close to the perfect savory pumpkin appetizer. How do we get even closer to perfection? By pairing these tasty morsels with a glass of good wine, that’s how. The pumpkin and pungent herbs in this dish pair especially well with Kendall-Jackson Grand Reserve Pinot Noir. 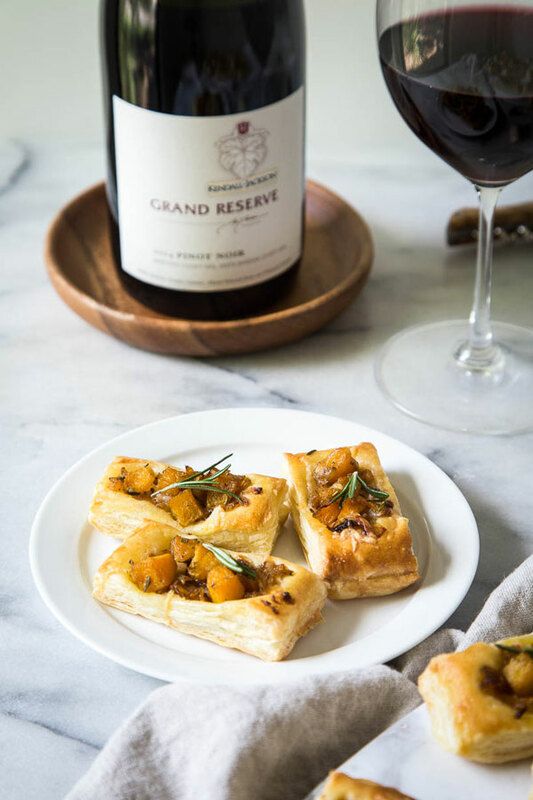 This particular wine is fruit forward with earthy aromas that play nicely with the caramelized onion and rosemary and it’s lovely velvety finish is reminiscent of the appetizer’s soft pumpkin pieces. On a final note, I will warn you that in order to make this recipe with pumpkin you will likely need to buy a pie pumpkin and cut and peel it yourself. This can prove challenging as uncooked pumpkins are very hard. I recommend following the steps outlined here. Alternately, there are some grocery stores that sell cubed pumpkin or you can ditch pumpkin all together and use butternut squash, which has a softer peel and flesh and doesn’t require microwaving to cut. Add a tablespoon of oil to a medium skillet. Over medium-low heat, cook the sliced onions, stirring frequently, until deep golden brown and caramelized. This will take up to 35-40 minutes. If the onions begin to brown or cook too quickly, reduce the heat, add a few teaspoons of water to the pan and continue to cook. Once caramelized, remove the onions from the heat and transfer to a bowl to cool. Return the pan to the heat. Add another tablespoon of oil, and add the chopped garlic to the pan. Cook for 1-2 minutes then add the pumpkin, rosemary and pinch of cinnamon. Season with salt and pepper. Cook over low heat, stirring occasionally, until pumpkin is cooked through. Be cautious not to stir the pumpkin too much, as we want the cubes to maintain their shape. Transfer the cooked pumpkin to a bowl to cool. Preheat the oven to 400F. Unfold the sheet of puff pastry dough on a baking sheet lined with parchment. Cut into rectangles that are approximately 2”x1”. Brush each rectangle of dough with egg wash and use a fork to pierce with holes. Add a few caramelized onions to the center of each piece of dough, then top with gruyere and cooked pumpkin. Bake for 10-15 minutes or until puffed up and golden brown. 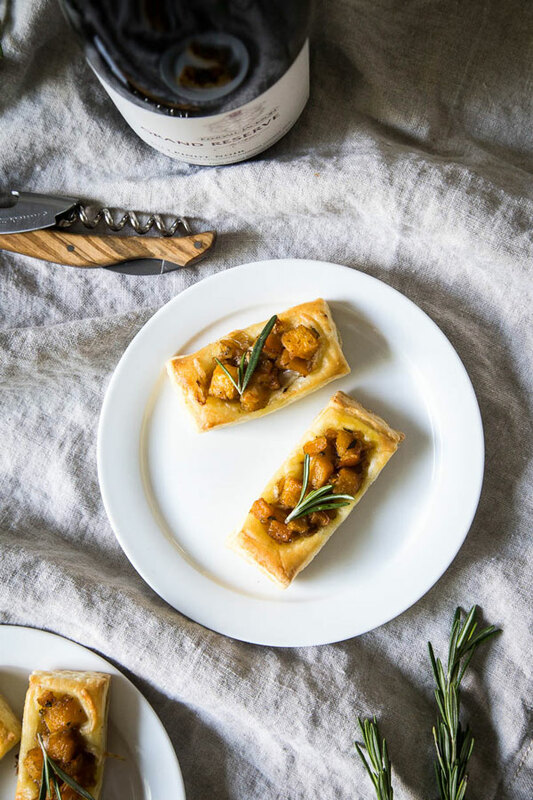 Garnish each puff pastry bite with a sprig of fresh rosemary. 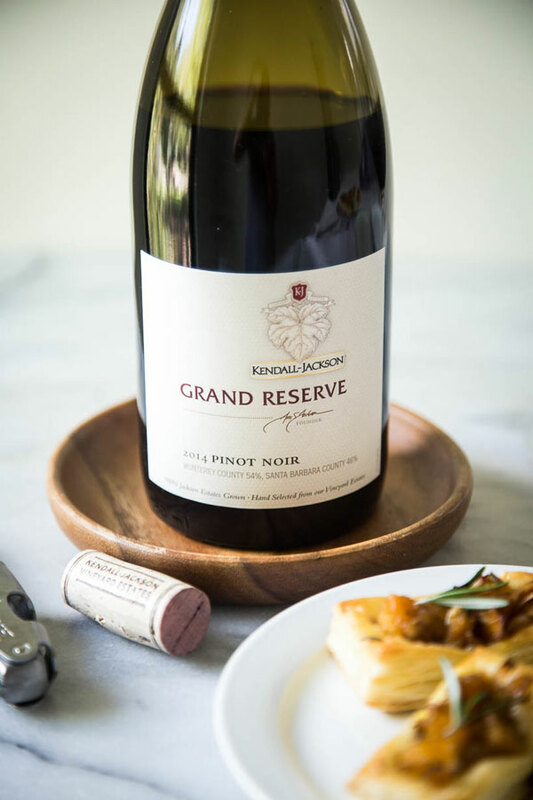 Serve with Kendall-Jackson Grand Reserve Pinot Noir.